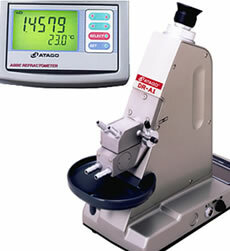 ATAGO's Abbe Refractometers are highly reliable instruments which measure Refractive Index. Compared with other types of refractometers, the Abbe refractometers are capable of measuring liquid and solid samples such as plate glasses, plastic sheets, and other solid films. By very simple operation that needs only to set the boundary line of refraction at the cross hairs, this refractometer directly indicates a measured value ( in refractive index or Brix ( % ) , selective ) in digits together with temperature on the display. This refractometer enables anybody to carry out measurement easily without reading of analog graduation. *Dispersive value cannot be measured by this refractometer.